In Japan, "doujin" titles are the video game equivalent of fan fiction. A very, very small percentage of doujin game developers go pro. The vast majority is confided to making fandom for fun. Because of that, many Japanese game companies look the other way. Disney is not a Japanese game company, and Disney is so not looking the other way. 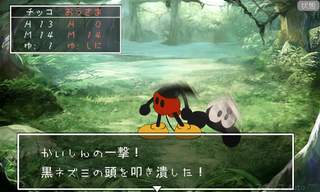 In doujin visual novel Hanako, players encounter Mickey Mouse as a Dragon Quest role-playing game type monster. The monster looks like Mickey Mouse, and it gets its head beaten off. The game's developers claimed that this was a "parody" and thus fair use, but according to website Japan-America News, Disney was pissed and sicced its lawyers on the game's developers, a doujin group called "AmoRico", for ¥6 million or US$78,000 in reparations. Thank you very much for playing Visual Novel "Hanako"
Due to a major and intricate reasons, we were unavoidably close our site and stop the development of our game. From today, year 2012 January 26, We're closing "Hanako Official Site" for indefinite period. We appreciate the players whom supported us. Thank you very much. From what has been shown of the game, this doesn't look like a Mickey Mouse parody. It looks like, well, Mickey Mouse. Update: Disney didn&apos;t sue them, it was scammers pretending to be Disney lawyers.